Call them toggle latches, over-centre catches, wire latches, hook clamps, latch clamps – whatever you call them, here at EMKA we have a great selection in plated steel and stainless steel for industrial and general purposes – most of us have seen them used on packing cases but they are widely used for closing panels, such as on specialist vehicles or for holding equipment in place or as temporary fixings for jigs and fixtures in the manufacturing and assembly process. They have the benefit of being quick to operate and fit tolerant – especially the spring loaded and adjustable versions – which are also vibration tolerant and ensure appropriate pull weight in varying conditions. Special purpose versions have quick twist adjustment while others have locking facilities for padlocks. Striker plates for straight pull or right-angle pull are available to match the particular requirement. 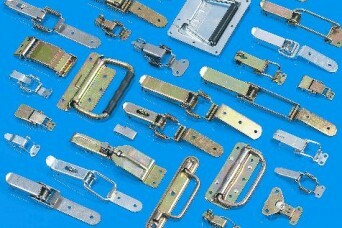 Share the post "Latches – toggle, over-centre, wire, hook, clamp,"
Previous post: High street down – manufacturing up?